- El creador de la Unión Patriótica de Cuba (UNPACU), José Daniel Ferrer, ha sido detenido en la ciudad de Bayamo, en el oriente de la isla, unos minutos tras el mediodía, a la entrada de la prisión de Bayamo, Provincia Granma, cuando se disponía asistir como testigo a la boda de Angel Yunier Remon Arzuaga, uno de los presos políticos de la UNPACU, quien se casaba legalmente ante una notaria que llevaba su esposa, Yudisbel Rosello Mojena. - Yudisbel Rosello Mojena también fue detenida, y más tarde liberada. - Con la excusa de llevarles en transporte, les ubicaron en dos vehículos diferentes y José Daniel fue detenido hasta 9 horas más tarde. - Desde su salida de prisión el 22 de marzo de 2011, Ferrer ha sido detenido en múltiples ocasiones que han sido denunciadas por organismos internacionales diversos, entre ellos Amnistía Internacional. - Identificado como una de las personalidades más relevantes de la disidencia cubana, al haber sido creador de la Unión Patriótica de Cuba (UNPACU) y unificar en ella a la gran mayoría de la disidencia en Cuba, es uno de los principales objetivos del gobierno cubano para aplacar un grupo que acoge a más de 7.000 activistas afiliados a la misma en toda la isla. - En el mismo día fue detenido en el oriente de la isla el activista de UNPACU de Palma Soriano, Rulizan Ramirez Rodriguez. Adjuntamos NOTICIA DE ÚLTIMA HORA: DETENIDO Y LIBERADO 9 HORAS MÁS TARDE JOSÉ DANIEL FERRER CUANDO ASISTÍA A LA BODA DE UN ACTIVISTA DE LA UNPACU EN PRISIÓN. 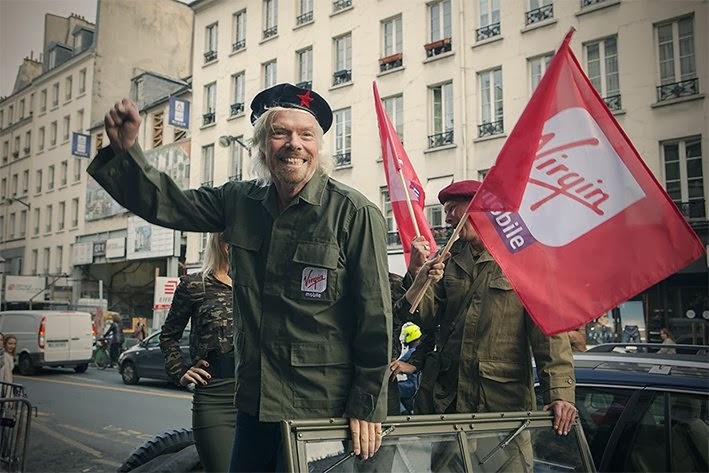 Still after 54 years of a brutal dictatorship in Cuba, we have Richard Branson in a Che Guevara outfit launching Virgin's Telib in Paris. To top it off, using the marketing slogan: "Peaceful Revolution." Their is no denying that Mr. Branson is a very successful businessman, but is he very naive, or is he really an admirer of the brutal Che Guevara? I JUST DON'T GET IT!!!!!!!!!!!!!!!!!!!!! My FREEDOM loving brethren......That above was the Surf report for Cabo De SanAntonio in Cuba this morning. but it would be really "XTREME" to paddle out and surf during a EARLY morning dawn patrol with my kids at Varadero .......and finally YELLING: "VIVA CUBA LIBRE".....knowing that my brethren are FREE! 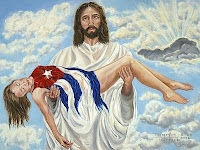 Hopefully... the day will come that ALL Cubans will be blessed with the gift of FREEDOM!!! "United States should allow all American citizens the freedom/right to travel to Cuba without restrictions"
yes......but who cares about the daily abuses by a dictatorial government?? - Entre 30 y 40 detenidos. - La población de Palmarito de Cauto, indignada, se enfrenta a la policía y agentes anti-motín, los cuales tuvieron que salir huyendo del lugar en un primer momento. - Los agentes volvieron con refuerzos y las detenciones se suceden en estos momentos de manera indiscriminada entre la población, ante cualquier sospecha de simpatizar con la UNPACU. - Al menos 3 de las Damas de Blanco detenidas están siendo liberadas. Today just doing my normal reading and looking for updates on Cuba, I come across an article talking about tour companies that take US tourist to Cuba. I say to myself: "Coño" just knowing what to expect when reading this article, and adding insult to injury, without even having Cafe Cubano yet this in the morning. Sure enough the article goes on about the different types of tours and their different eclectic names, somehow making the reader believe that if you take these tours, you are somehow intellectually and philosophically better for it. This month the luxury travel company began offering a 10-day program for up to 24 people that includes a private salsa lesson, attending a “Buena Vista Social Club-style” concert, and meeting Salvador Gonzáles, an artist whose efforts have transformed an alley in Havana known as Callejón de Hamel into an Afro-Cuban art and music destination. Participants will also tour Havana with a local architect; eat at a paladar (a family-run restaurant) and listen to the owners discuss Cuban cuisine; go for a stroll with a painter and ceramist, José Fuster, before having dinner at his home; visit a cigar factory (and learn about life on a working tobacco farm); tour Las Terrazas, a Unesco biosphere reserve; attend a lecture on the history of United States-Cuba relations; and even play baseball with the locals. From $5,395 a person for double occupancy (the single supplement is $895). Information: Abercrombiekent.com/travel-destinations/cuba. This company, known for its countryside walks, is now offering tours to introduce travelers to “Cuban people from all strata of society.” The itinerary includes meetings with the artists and residents of Luyanó, a community development project; an exploration of the Unesco World Heritage site Old Havana; discussions with religious leaders about Afro-Cuban culture and the Santería religion; and a look at the life of Ernest Hemingway during his time in Cuba. The countryside walk is in the Viñales Valley, west of Havana, and includes a visit to coffee and tobacco farms. From $4,895 a person for double occupancy (the single supplement is $695). Information: Classicjourneys.com/cuba. For the first time, Discovery Tours is taking groups of 10 to 18 people on a nine-day tour to listen to traditional Cuban music at the Museo de Artes Decorativas; learn about Old Havana’s restoration projects from local city planners and architects; attend an Afro-Cuban religious ceremony; beef up on United States-Cuba relations during a policy talk; and chat with jazz musicians after they perform at the Instituto Cubano de la Música. Rates from $3,599 a person for double occupancy; from $3,918 for single occupancy. Information: Discovery-tours.com/small-groups-cuba-9dcuff13.aspx. This nonprofit arm of Grand Circle Corporation offers small group tours, like Cuba: A Bridge Between Cultures, and new this year is a 13-day tour called Cuba: Music, Culture & the Roots of Revolution. Stops include the island’s second-largest city, Santiago de Cuba, where visitors can learn about the area’s Afro-Cuban influences; Baracoa, near the landing place of Christopher Columbus; and, of course, Havana. Rates from $4,395 for double occupancy; no single supplements for the rest of 2013. Information: Grandcirclefoundation.org/cuba. In response to demand for shorter getaway options, Insight Cuba, which specializes in small people-to-people trips, is offering a new six-day tour called Vintage Cuba for up to two dozen people. From the colonial town of Santa Clara (home of the Che Guevara Mausoleum) to Havana, this tour (beginning November 2013) takes travelers on a vintage steam train; introduces them to mechanics who maintain the vintage cars that have come to be associated with the island; and shows them the Cayo Santa María and the coastal town of Caibarién, known for its beaches. From $2,995 a person for double occupancy; from $3,395 for single occupancy. The company, which has 150 departures to Cuba scheduled through June 2014, offers other tours, as well, including Undiscovered Cuba (12 days), Classic Cuba (8 days), Scenic Cuba (8 days), Jazz in Havana (5 days), Cuban Music & Art (9 days) and Weekend in Havana (4 days). Information: Insightcuba.com. This nine-day tour from Miami includes an architectural walking tour of Old Havana with stops at workshops to chat with artisans about restoring the area; a visit to the studio and home of Mr. Fuster, the artist; Ernest Hemingway’s estate, Finca Vigía, where he lived and worked for more than 20 years; the Cienfuegos Botanical Gardens and the French-influenced colonial town of Cienfuegos, a World Heritage site; the University of Havana to meet with professors and students; and the Casa de Africa to learn about Africa’s influence on Cuba. There is also a block party in Santa Marta and a visit to the old town of Matanzas (including the Pharmaceutical Museum and the independent art book publisher Ediciones Vigía). From $5,495 a person for double occupancy; from $6,045 for single occupancy. Information: Smithsonianjourneys.org/tours/cuba. Some other groups with licenses to operate people-to-people Cuba tours include Austin-Lehman Adventures, Friendly Planet Travel and the Center for Cuban Studies. - Librado Linares, que desde su salida de prisión ha continuado su lucha pacífica dentro la isla por la libertad, fue uno de los tres últimos presos liberados del “Grupo de los 75”, en prisión tras la Primavera Negra de Cuba. Fue condenado el 4 de abril de 2003 a 20 años de prisión y considerado Prisionero de Conciencia por innumerables organizaciones internacionales (empezando por Amnistía Internacional el 19 de marzo de 2003), y liberado en marzo de 2011, tras haberse negado a ser expatriado a España para lograr su liberación en 2010, al igual que ocurrió con Félix Navarro y José Daniel Ferrer, Coordinador Nacional y Secretario Ejecutivo, respectivamente, de la Unión Patriótica de Cuba. Adjunto les remito enlace a elementos gráficos (fotos y vídeo) para complementar las informaciones sobre la concentración de 201 activistas pro-derechos humanos de la UNPACU en el Santuario de la Virgen de la Caridad del Cobre en Santiago de Cuba, junto a 57 Damas de Blanco. Lo que van a ver en vídeo es algo que jamás ninguna organización disidente ha protagonizado antes en la historia de la dictadura. Estamos emocionados por el hecho de aunar 257 voces disidentes en paz hablando de libertad y tomando las calles con fraternidad y pacíficamente. Nuestra lucha es hablar con libertad, reunirnos con libertad, elegir con libertad. Algo que ahora Cuba no tiene. TAN SOLO LIBERTAD, nada más, pero sobre todo nada menos. Pronto seremos miles, y también lo sabrán de primera mano. Necesitamos su capacidad para transmitir esta revolución pacífica que se está gestando en Cuba. Eso hará que se acelere este proceso pacífico de cambio. Sentimos no haberles hecho llegar antes los elementos gráficos, pero las dificultades técnicas y de recursos para sacar este tipo de documentación, pesada en términos de transmisión, fuera de Cuba excede los requerimientos muchas veces del "tiempo real", especialmente en el Oriente de Cuba, donde ciudades como Palma Soriano, con 130.000 habitantes, tienen por ejemplo un sólo punto de acceso a Internet lentísimo, similar al antiguo acceso por Red Telefónica Conmutada y módem (RTB) en España de los años 90, con 4 ordenadores y con unos costes que se "comen" el salario mensual de una persona en tan sólo 2 horas de acceso (el 41.6% de su salario mensual, 300 pesos en moneda nacional cubana, para una hora de navegación). Estamos seguros de que pronto podremos ir mejorando en este aspecto. Su solidaridad con lo que está ocurriendo en Cuba sin duda hará que se mejoren de forma indirecta todos estos aspectos. ó Ovidio Martín Castellanos, responsable en Santiago de Cuba de la UNPACU, en el +53 58 228297, que se encuentra en el lugar de los hechos. Cuba......the swim from Cuba to Florida! Diana Nyad....nope now this is "XYREME"
Diana Nyad......who are the Damas de Blanco? 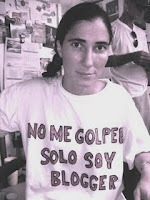 Cuba news.........53hr swim for Diana Nyad!!!! CUBA: the 53hr swim and the missiles! Diana Nyad historic swim from Cuba to Florida!